New Delhi: President of India Pranab Mukherjee today said that frequent elections is a costly affair. There is drainage on financial resources for holding and conducting elections and we are ready to pay this price for democracy. But it should not be at the cost of development for a developing economy like ours. So we must find a way out to ensure that elections are held for federal government and State Assemblies together. The president was addressing the Defence Estates Day Lecture 2016 function in the capital. He said that so far as Lok Sabha is concerned, it is required under the Constitution that within 180 days Lok Sabha must meet. Therefore Lok Sabha elections are a must once it is dissolved…there is no other rule that can govern Union Government….but in States there is a room available. After 44th amendment of Constitution, President’s Rule is confined to one year subject to approcval of both houses of Parliament. There is no problem if elections are due in a State within one year of federal election but if it is not within one year then President’s Rule should be extended beyond one year to synchronise with Lok Sabha election. The Constitutional experts can think over it, the President said adding by Constitution Amendment we can provide flexibility to have more than 1 year of President’s Rule. There were four general elections in 1952, 1957, 1962, and 1967. After that the chain was broken due to political reasons. Now we have elections every year in one or the other part of the country and administrative work comes to a standstill because no new developmental work is taken for more than one and half months when the code of conduct is operational. The president said we can explore whether the election period could be shortened and work relating to Government of India in states where elections take place are not affected. Mukherjee cited the example of 1998, when the government lost by 1 vote and there was election in 1999. He said that possibilities can be explored and frivolous no-confidence could be avoided. After 1999 experiment, he said we have noticed in LS, Houses might have been disrupted day after day but no body moved a motion of no-confidence as they burnt their fingers several times in the ’90s. Mukherjee observed that political parties are not magnanimous enough to give adequate representation to women in parliament. for that also Constitution Amendment is required. A bill in this regard has been passed by Rajya Sabha. It should be revived and as there is single party majority in Lok Sabha, the possibility of passing it in Lok Sabha should be explored. The House is not a place for dharna and disruption. This amounts to “gagging of majority” by the minority, he said pointing out that that members of Parliament are supposed to discuss and transact business and not disrupt. Some Lok Sabha contituencies have more than 2 million voters. For 543 members of LS, there are more than 800 million voters and a population of 1.28 billion which will be much larger very soon. 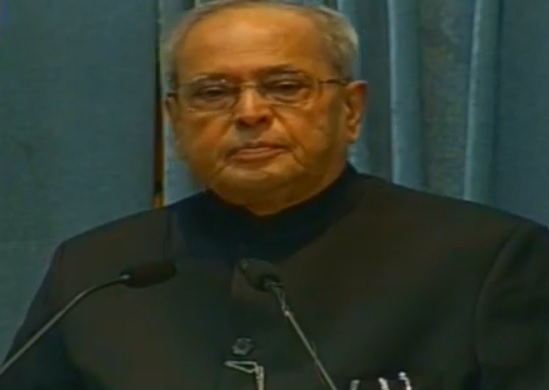 In this backdrop the President asked whether we can think of larger number of Lok Sabha seats. For that we will have to think of delimitation and this can be through electoral reforms he suggested.